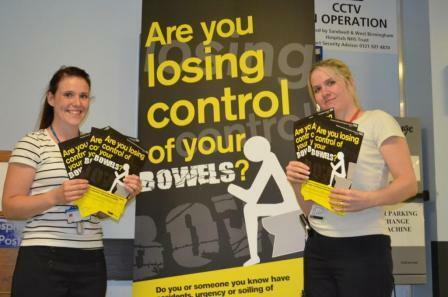 An eye-catching campaign is being launched to urge people in Sandwell with debilitating bowel conditions to get treatment. The campaign, which is being featured on posters and advertisements across the borough, is to promote the FINCH service, which offers investigations, treatments and advice for patients experiencing faecal incontinence, constipation and rectal evacuatory dysfunction. The service provides patients with a range of treatments including biofeedback, irrigation and bowel retraining programmes. The FINCH service also delivers an integrated care pathway for faecal incontinence, which delivers specialised assessment and treatments, streamlines the patient’s journey and minimises the patient’s embarrassment, as well as ensuring that the right treatment is given to the right patient in the right environment. Jodie Smith, Bowel Function Clinical Nurse Specialist at the FINCH Service, said: “The campaign urges Sandwell patients with faecal incontinence or leakage, or urgent and frequent stools, to ask a healthcare professional to refer them to the FINCH service. We want people to know that there is a range of treatment options available to them, so people don’t have to be suffering in silence. If you are registered with a Sandwell GP and think you may need to access the ICP service, ask your GP or other health professional to refer you, or go to https://www.swbh.nhs.uk/services/continence for more information.